Back in December 1970 I discovered Gilliom Mfg. 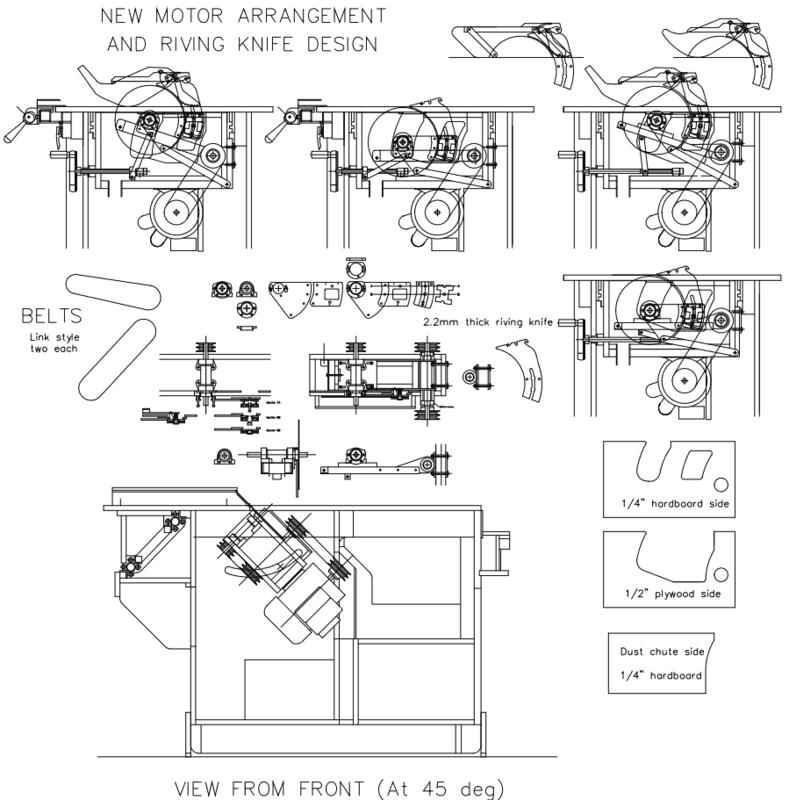 Co. and promptly ordered plans for their Tilt Arbor Floor Saw, 12 inch Band Saw and 18 inch Band Saw. It took 24 years to find the space for a decent home workshop! I decided to build the Tilt Arbor Floor Saw first and ordered some parts and started building in early 1996. I did not purchase the whole kit. I had mulled over those plans for so long that I decided my ambitions deserved a more sophisticated (or updated, if you will) design. 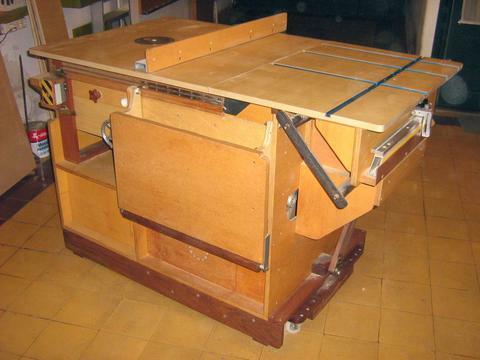 I went for a totally enclosed motor and a sliding table for crosscuts. 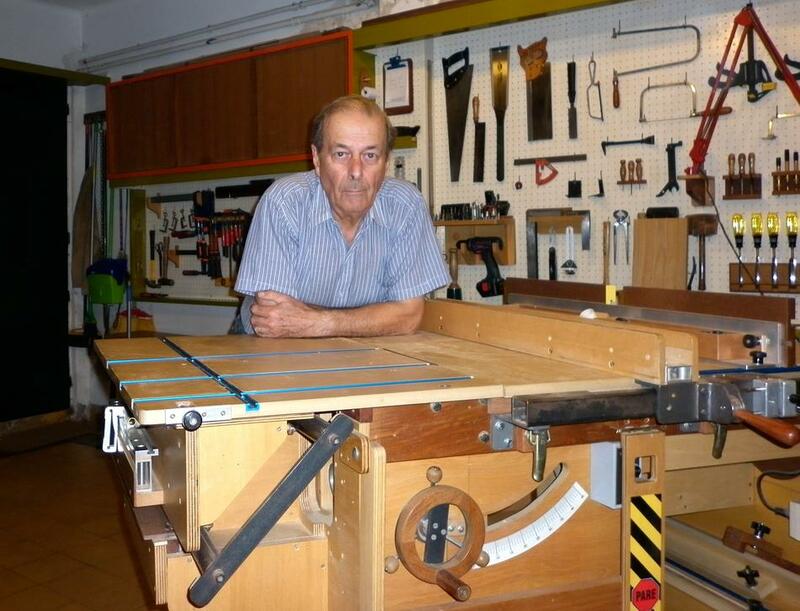 There's a lot of Gilliom inheritance beyond the parts, which are the heart of my saw. 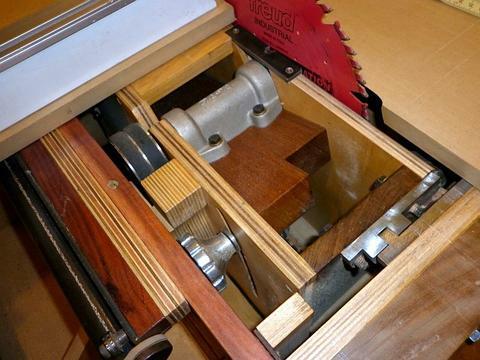 Performance is outstanding for a wooden saw and it has seen a LOT of use. Probably the sheer weight of the whole thing plus the absorbing qualities of hardwood (mind you, maple looks like balsa wood when compared with some *heavy* South American hardwoods, such as "ipe", known as Brazilian walnut) add up to a very serene operation and low noise. 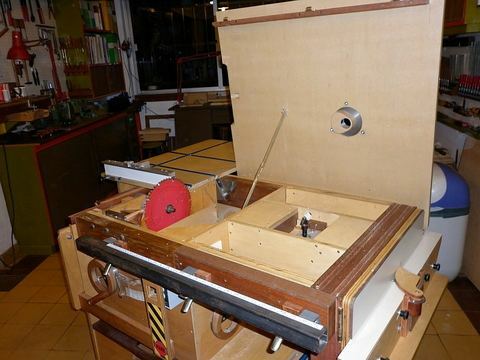 So you see it's quite possible to shop-build decent machinery. It may take time and some effort, but the results are most certainly rewarding. My resources would have never allowed me to purchase this kind of machinery. They may not be industrial quality but they certainly are far above average and provide me with what I need. The table saw itself was just that, at first. 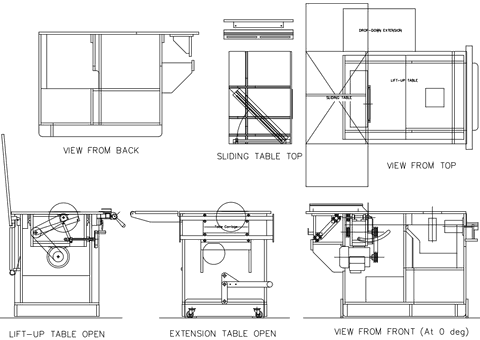 Later on it evolved into a workstation incorporating a router table (with own-design lift) and a small jointer built with plans from ShopNotes (Volume 14, Issue 80). 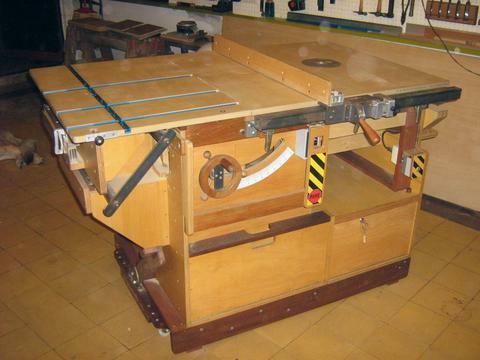 Improvements were incorporated over time: A panic shut-down bar (knee operated), micro-adjustment in crosscut and rip fences, a grid of T-tracks on the sliding table, new bigger hand wheels (shop-built) and many more smaller mods. Maximum depth of cut (with a 10" blade) is 74mm. Uruguay has been metric since 1863. However, there was a marked British influence for nearly a century, so some items still adhere to the imperial system. Wood, for example, is sold by cubic feet (1'x1'x1") and most common sizes of screws and bolts are also imperial. and crosscut fences, hand wheels, etc.) are all shop-made. A close-up of the rip fence micro adjuster. A major modification took place about a year ago. I decided to abandon the American-style access to the saw blade and switch to a European-style layout. This involved replacing the whole table with a new one. 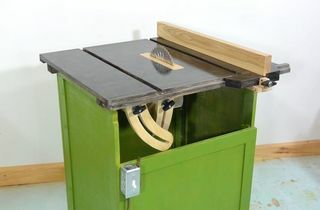 This new table is hinged at the back of the saw cabinet and held down with three heavy toggle clamps at the front. As it lifts up completely it provides very good access to change blades and to the router lift, for maintenance, cleaning, etc. You can see the small jointer on the right edge of the saw. 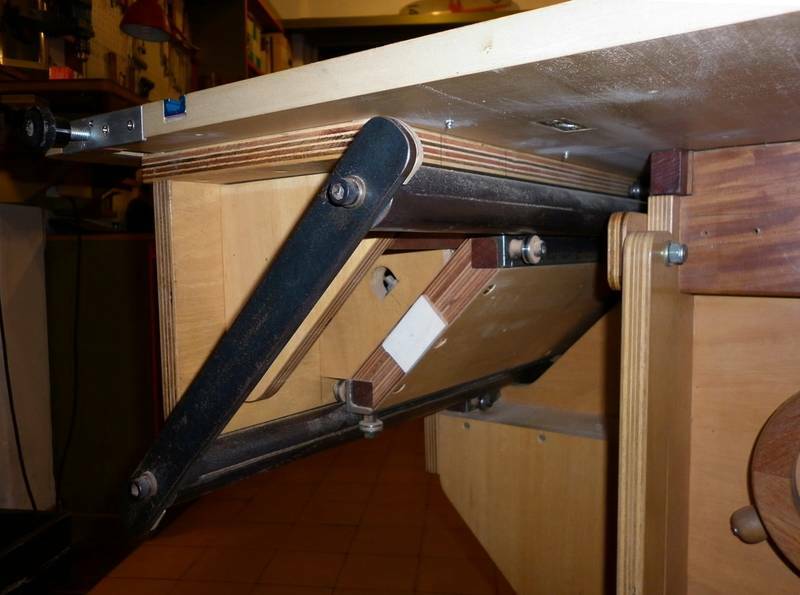 The new table also required a new top for the sliding mechanism. 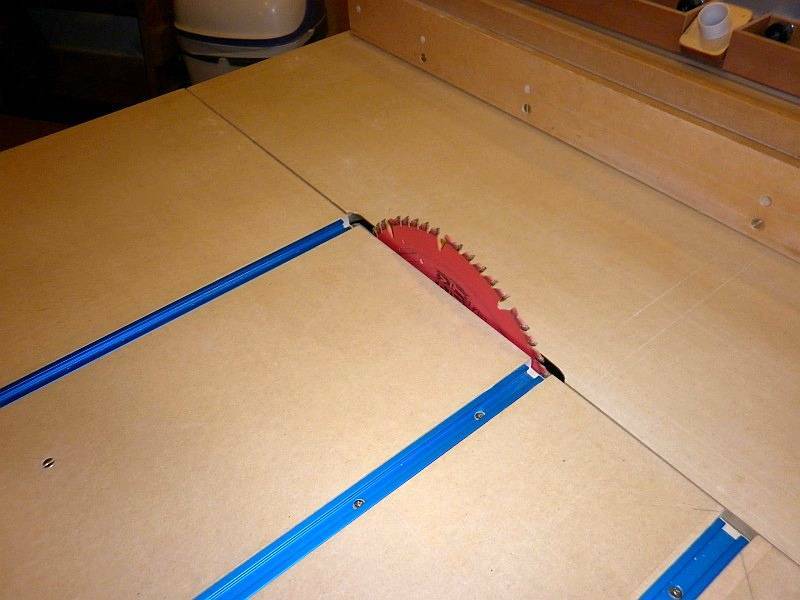 Now both tables adjoin the saw blade in an almost zero clearance fashion. In the near future I may add replaceable hardwood inserts when the present edges get chewed-up with use. 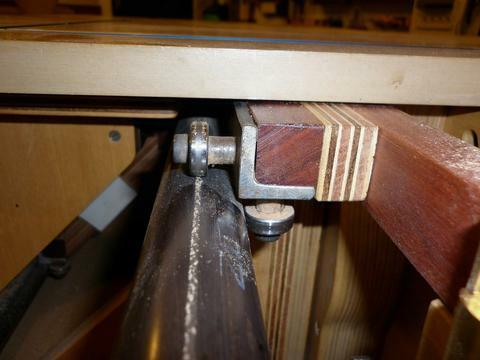 A crosscut fence used for odd angles, mitering, tapering and so forth. The black pipes are joined at the ends with 32mm x 6mm steel bars. This metal rectangle rides on 16 19mm x 6mm ball bearings. 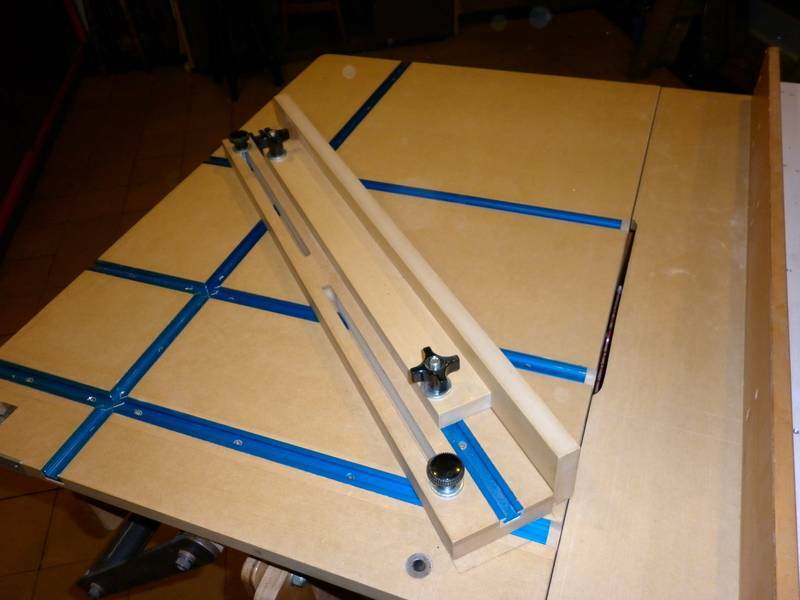 8 of them are mounted on the tablesaw body, the remaining 8 are mounted between the pipes on the sliding table. All mounts are eccentric to allow for adjustment. 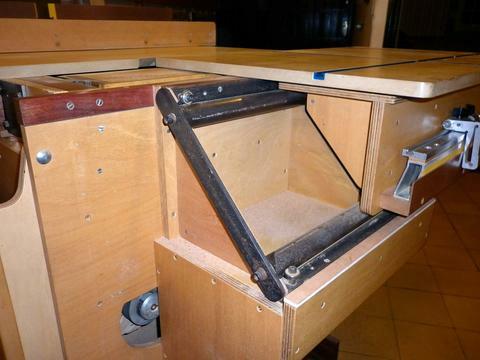 The whole unit works like a giant telescopic drawer guide. 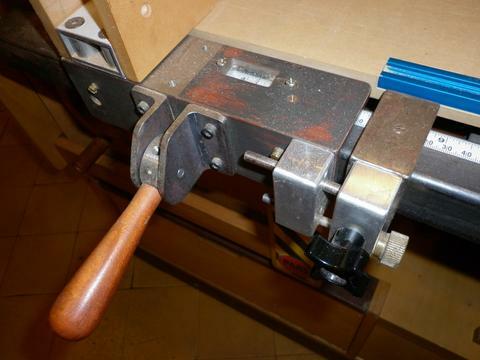 It works smoothly and uses less space than a single or double fixed rail. 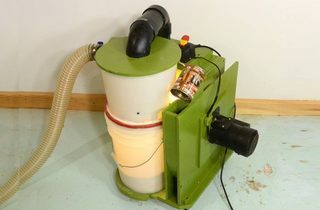 The dust collection unit. 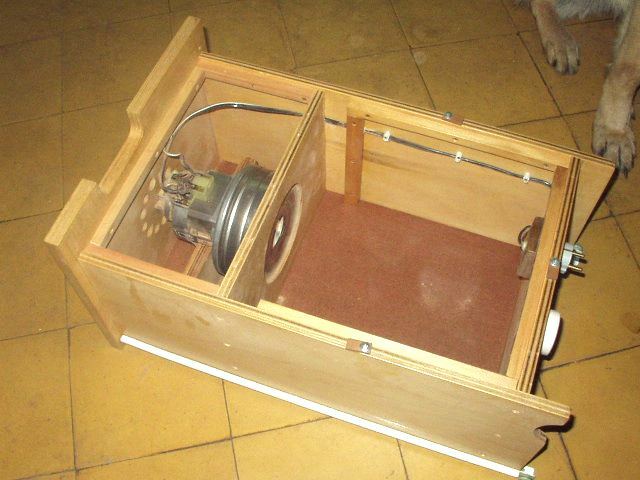 A vacuum cleaner motor pulls air through a filter (removed in photo). 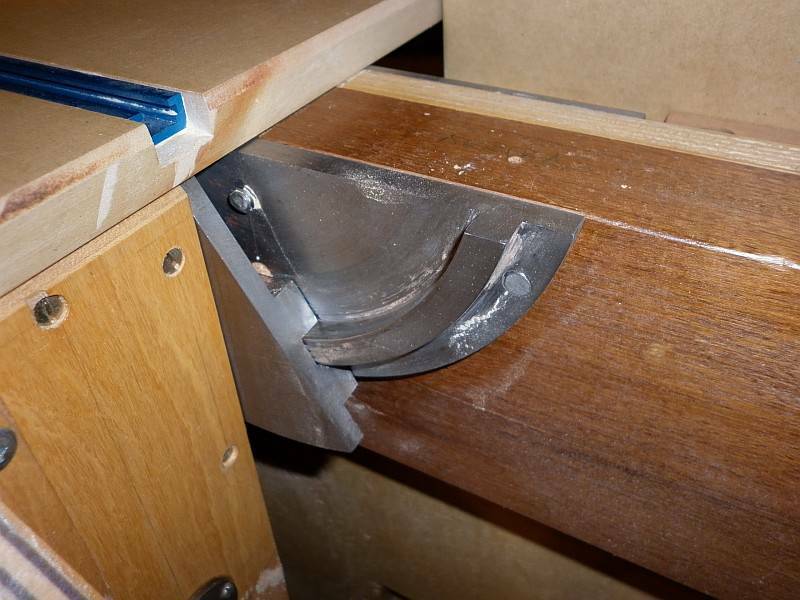 Sawdust gathers in the large compartment. Blade dia. is 10", 5/8" arbor hole. Tilts left. 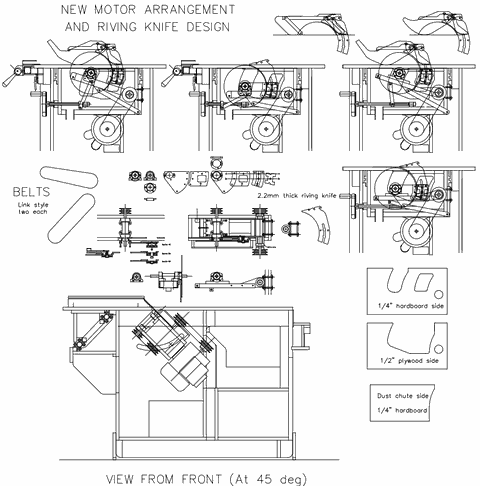 There are also some CAD drawings of the saw, with a planned change to how the blade lifting mechanism is to work. 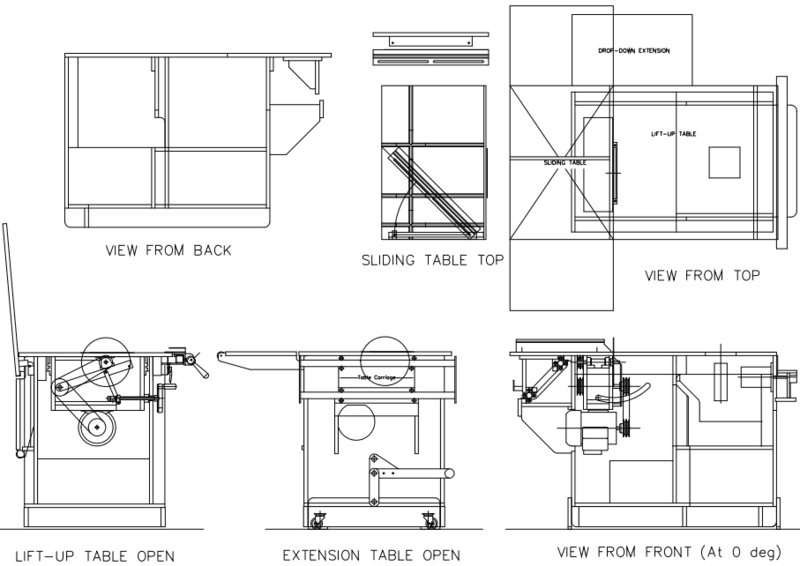 Please note that the drawings are 2D plan views, not 3D models.